Find out how to navigate our core database using different entry-points. Each is named after- and organized for a purpose, making it easier and quicker to find and select the data you need. Use the time series tab (Browse) or Series browser tab (Analytics) to navigate the entire collection of time series available in the application. The first step to navigating the data is selecting an entry-point to look at from the drop-down menu. When navigating data in this way, selecting an entity from the tree will generate a list of the relevant data in the pane below. If you double-click or press ‘Enter’ to open a node of the data tree, the selected node will be pushed to the top of the window to facilitate the navigation within it. Clicking once on the arrow to expand a data node will keep it where it was and will not adjust automatically the view in the series browser. When focusing on a specific country and/or region. And, if you want to access detailed data in an organized and structured way. The region World will also give you access to some “non-country specific” data. In this view, you can apply filters to only display specific countries and regions in the list. For more information click here. Here the data is organized primarily by country and regions, and then by economic categories. Data categories and subcategories are only shown if data is available for the selected country. The region “World” also contains data that does not belong to any country under “Region: World”. For instance, Commodity Indices or Hedge Fund Indices can be found there. For finding data from a particular source, or when you are familiar with the way the source organizes the data. Source & Release is structured similarly to Country & Region, but beneath each node you will find the sources corresponding to that country or region. You can apply filters to only display specific countries and regions in the list. This means that only sources associated with these countries will be displayed in the tree. A specific material describing how to create filters is available here. In this view, you find national sources by accessing each country, and international sources by accessing regions., such as World. Bear in mind that it is the country, or region, of the source that you should select, and not the country that the data references. For certain releases, we categorize and organize the data in accordance with the source. When looking for one concept across several countries. If you are looking for a leaner and simpler tree structure to access key indicators. This view is an easy way to access similar key data, or concepts, for several countries. The data can be navigated through two primary categories, All sources and National sources. 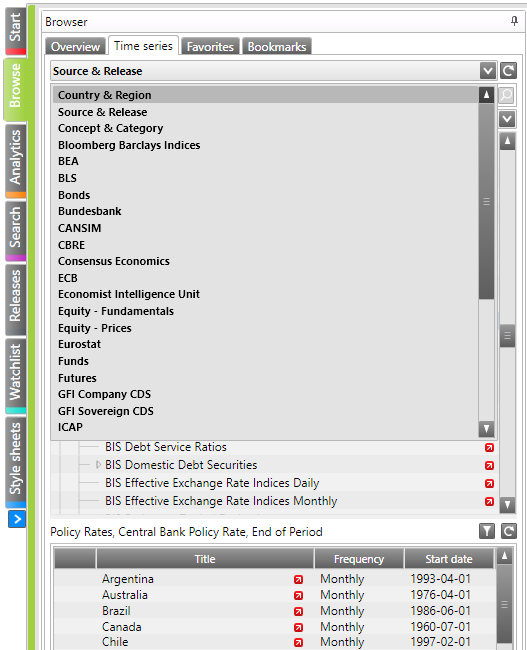 The National sources category only includes indicators from local or primary sources. Because of methodological differences, granular data can’t be compared across local sources, which means that only a limited selection of indicators are provided for this view. 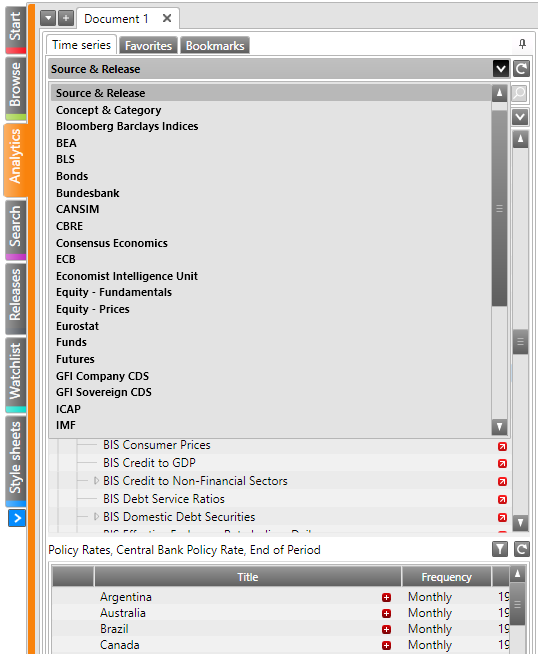 All sources include harmonized data provided by international sources like IMF, Eurostat, ECB OECD, which can also be accessed as individual database views. The data is organized using the standard Macrobond economic categories and key concept sub-categories.